For a startup to get funded you want to exercise due diligence to be sure everything is in order. 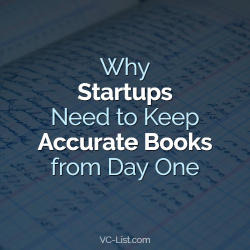 Savvy angel investors and venture capitalists always look at accounting records. Investors want to see cash flow and “burn rate,” or how quickly you “burn” through the funds in a clear, well-organized fashion. To help understand how startup founders can set up their accounting records for success, we will be interviewing Michelle Carley, a bookkeeping expert. She has worked with thousands of small businesses and startups to organize their accounting books which led her to develop accounting software called Big E-Z Books, used by hundreds of businesses that are looking for something similar to Quickbooks, Sage, or Freshbooks. Joanna – A common problem for first-time startup founders is blurring the lines between their personal finances and business finances. What are the best steps for startup founders not to do this, besides getting a dedicated bank account and credit card for startup expenses? Michelle – I’ve heard it once said that even one personal transaction recorded in with your business records can “pierce the corporate veil” and expose your business to liabilities. We open businesses and structure them as LLCs and other corporations to limit our liability. We really don’t want to jeopardize our business structure with a careless act. It is something to keep in mind when recording and categorizing your transactions. You know, it happens to all of us. We’re at the store making a personal purchase and realize we don’t have our personal credit card with us – only the business credit card. So, we use the business credit card. What I would do then is be very upfront and honest when categorizing the transaction in your bookkeeping system. I would list the amount in a category such as an Owner’s Draw or, in the case of a corporation, I would put it against Shareholder Distributions. You want to be above reproach on this stuff. Joanna – When someone decides they want to get a startup off the ground and they use their own money to fund it, how should a startup founder list their initial investment in their accounting records? Michelle – Keep a list (in Excel or on paper) of start-up expenses before you open your business bank account and keep receipts related to those expenses in a folder too. Once your bank account is established, you can designate a main category called “Startup expenses” in your bookkeeping system. Since some amounts may be taxed differently from others, I would break them down further by sub-categorizing with titles like consulting, research, travel, etc. Joanna – When friends and family of the startup founder invest in their startup, how should it be listed in the accounting records? Michelle – If the friend or family member is a shareholder, it can be listed as a loan or a contribution to the equity on the books. If they are not a shareholder, it is definitely a loan and needs to be repaid with interest. This is a conversation that needs to take place with your accountant or tax professional who knows your business intimately. In both cases, you can place the amounts of loans received under the title “Loans” and your tax professional will adjust for it later. Joanna – When a startup is getting off the ground and products are getting prototyped and tested, there are expenses. How does a startup founder list these expenses in their books for failed products? Michelle – Until you start charging customers and collecting money, you would want to track all the expenses as start-up costs. When you meet with your tax professional, they can advise you as to what should be considered research and experimentation expenses and what should be listed as start-up costs. Then they will adjust your books and tax return accordingly. Joanna – When products or services start getting sold, when is the best time to declare revenue in your accounting books? I do know it is a risky approach to do so at the time of sale without thinking of expenditures. Michelle – If you haven’t started collecting money for your product or service, you may want to get the advice of a CPA with lots of experience with startups. From the moment you first start charging for your products and services, your books will show a profit or loss. They say “timing is everything,” so it pays to be diligent and check into this thoroughly. It is important for startup founders to keep clear, accurate bookkeeping records for the future success of a startup, if it is self-funded or funded by venture capital. Happy Bookkeeping! 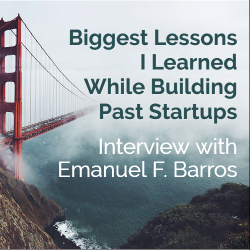 This is an interview with Emanuel F. Barros, a serial entrepreneur who has spent 30 years working in the technology sector. He began in software, computer peripherals and semiconductors, before moving onto NASA Ames Research Center in 1996 to work on flight hardware for space-based research on the space shuttle and now the space station. 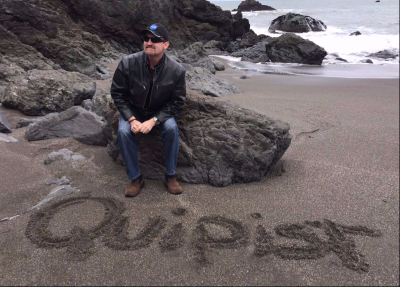 He left NASA in 2002 to work full-time in a previous startup, but returned to NASA 10 years later. NASA in 2012. Emanuel has started several startups over those years and is currently working on another startup with a co-founder also a NASA engineer called Quipist.com a social good platform. Joanna: Emanuel, this article is primarily about lessons learned from your previous startup experiences. My readers are interested in learning about your process and how you integrate those lessons into subsequent startups. My questions will get to the heart of those lessons. Emanuel: First of all, I’d like to thank you for this opportunity to talk about the knowledge I’ve acquired from my years of working in technology, research and startups. I’m happy to pass on any of my tidbits of wisdom and answer your questions the best I can. Joanna: One of your past startups had tremendous potential. It had well thought-out products and in-demand services. Yet, it was unsuccessful. It failed due to a new team member and a misguided change in direction. Can you tell us more about this? Emanuel: You’re referring to one of my previous startups, I was the visionary founder and technology developer with a great team and various investors who were financing the startup. We were at a point where we were well on our way to big success! Most importantly, we had customers ready to buy our products and services as fast as we could provide them. Of course, having customers equals revenue, equals achieving milestones that lead to success. It’s the nature of startups to have subjective perceived risk, so the news of ready, waiting and paying customers stirred up the investors, prompting them to insist on hiring an MBA to replace me as the interim chief executive and take over managing the progress, leaving me to focus on the technology. Once he was onboard, he had a huge influence on the investors regarding finances. At the time I felt it was premature, but everyone else believed it was better to plan ahead and be prepared for the next level of success so I agreed. Overall it was a great plan, but unfortunately getting the right person onboard is also critical and tricky. A candidate can have great educational pedigree, look great on paper and even have an amazing rolodex of contacts. Unfortunately in our case, that person was missing one very important quality. Although he had great business credentials, he was not aligned with the vision and mission as the rest of the team: To deliver the product and services we had to the existing customers as quickly as possible. Instead delivery was delayed and the little capital we had, was spent on building up how the company looked to new investors by getting a bigger office etc. The result? Losing focus of what was already working. This can be deadly for a startup. Before we were out of the woods financially, we were bankrupt. When success is in the palm of your hand, and it’s abruptly snatched away, it’s incredibly heartbreaking. This painful and unexpected lesson taught me that clear communication and documented buy-in by everyone involved is a must for the startup visionary. The assumption made by our team that someone else could be brought in to carry out our vision and mission accurately was a mistake. He did an excellent job selling his ability to make it happen for us, which didn’t work. Sometimes you need to listen to your gut and communicate firmly to the team. In hindsight, I should have proposed a compromise. I should have insisted on completing the product build for our few customers before hiring an outsider. This example shows how critical it is to remain focused on the things that will start to generate revenue. No one imagined we could go bankrupt so quickly. Joanna: How can other startups avoid the same mistakes? Emanuel: The vastness of information passed around about startups can be daunting, misleading and confusing. What qualifies as a successful startup? What qualifies as a failure? Is there anything else other than a success or failure? The questions never end and they shouldn’t. Unfortunately more than 90% of startups fail, even when they have a great product or service, great branding and paying customers. It just takes one team member who is not in alignment with the mission, vision and full dedication of the rest of the group. As the cliché goes, “there’s no ‘I’ in Team”. Having a team that works well together matters far more than anything else — I can’t stress that enough. Members on a startup team need to keep their egos in check, work seamlessly together and be completely committed despite setbacks. Bickering, second guessing or rehashing past setbacks only erodes team confidence. Thinking of the team as an organism that depends on all its parts to survive can be helpful. It’s all about the team and its commitment to succeed. There’s also the long game and the short game. Success means something different with everyone. If you are a truly dedicated team player, you are in it for the long game. You’re thinking outside the box, and accepting mistakes as setbacks and an opportunity to learn, moving forward in a more productive way. The short game is about turning a quick profit. Short-game players fail easier from lack of dedication. They give up too fast, and lose confidence and focus after a single setback. True long-game players don’t give up. They are the entrepreneurs who understand it takes time and dedication to achieve lofty, but worthy goals. Profits are never the primary goal, but simply a positive side effect of executing and staying committed. The long game is about the mission, vision and the team. The short game is about greed. It’s not as black and white as success or failure. The major victories are clear once startups have executed a successful exit strategy, but there are many other types of successes worth identifying. .Setbacks and loses happen, but a true entrepreneur never has a complete failure. If it’s impossible for you to see a failure as an opportunity to course correct or learn, entrepreneurship and startups may not be your game. Joanna: What should founders of technology and engineering startups when considering outsourcing or hiring staff to manage financing or operations? Emanuel: It’s important to focus on core competencies, which can mean outsourcing or delegating other parts of the business to new staff or third parties to manage the supplemental tasks of running a successful venture. It’s not how much or how little you hand over, it’s more about determining if the timing/person is right and the criticality of what is being outsourced. The leader always needs to know the macro view of every aspect of the company, especially the finances. There is a difference between micromanaging team members vs. overseeing every aspect of the startup by communicating often and being engaged every step of the way. It is important that whomever is chosen to lead the team, whether it’s the visionary or someone trusted by the visionary, that they have or develop good management/leadership/communication skills and are capable of supporting the mission and vision. Joanna: Who do you think should be managing finances? Emanuel: If you’re on track to start revenue, then you want someone who is great at tracking every cent until you have incoming revenue. Skillsets and track records are more important than educational pedigree. Someone committed and honest, whom can stay focused and watch every penny, is best. Even better is someone who has experience and knowledge of startup finances. Priorities in a startup can be different from a company with consistent revenue. Manage your books carefully and communicate budget issues, if any, with your team often. Most of all, prioritize your budget carefully every step of the way. The last thing the team wants to hear is that it overspent before reaching the next revenue milestone and that the startup is nearly bankrupt. Everyone on the founding team should always know where the company is financially. Setting expectations is important. Joanna: What tips can you give other budding startups for vetting co-founders, board members, advisors and investors? Emanuel: It’s not always the best pedigree and education that makes the best team players. I’ll take someone without an Ivy League education who is humble enough to work as a team player and execute the vision, versus someone who wants to impress you with their credentials before wrestling you in a different direction. Albeit, there are times when a change of direction is needed because things aren’t working, but if things are working and leading you to revenue, don’t change your focus. I look for confidence, humility, loyalty, integrity and respect in the person I’ll be trusting and working closely with. Will they dedicate like the rest of the team? The best vetting is consulting their previous colleagues, to get a feel for their level of commitment and core competencies. Also, don’t hold past failures against them. Sometimes past failures are the best experiences to learn from. Instead ask about what happened and what they learned from it. That will give you a much better indication as to who they are. Although a leader must see themselves as part of the team — having positive relationships with each team member — they also must have a neutrality that can help them make good objective decisions about potential hires. They should never add someone to the team simply because they like them or share common interests. A new team member should have the right qualifications and, of course, references and background checks should come back clear. I also look for automatic positive rapport with multiple interviewers over multiple days. Congruency with what the potential team member says and does. I also follow my gut. If everything seems right but I have a funny feeling, I listen carefully. Continuing with the theme of objectivity, the vetting process doesn’t end with the bringing on a team member congruency, reliability and performance over time is the true test. In a team you either succeed as a team or fail as a team. Joanna: What is a “social good” startup? Why a “social good” startup this time around? Emanuel: My current venture is about community and empowering that community to make positive change in the world with “social good” causes. I’ve reached a point where it’s more important to take actions that will bring about social good in a positive make-a-difference sort of way. Recently I read Give and Take by Adam Grant, which was given to me by my co-founder in this new venture. This book aligns perfectly with who I am: It explains how people who give more than they take are much more successful in the long run. That being said, you want to be a giver and align yourself with other givers. Although we are a for-profit venture, it’s more important that we are aligned with making those social good goals a priority. Non-profits have a stigma attached to them. For many people, that word “non-profit” automatically equates to never-ending fundraising or professional panhandling. It means constant struggle and never enough budget. I believe that with the new world of high-tech/information age, it’s becoming much more possible to fund causes that give back to the community without the struggle attached to non-profits. I’ve been asked, ‘why don’t you just start a non-profit?’ I’ll answer that with, “Why struggle when you can run a for-profit and support your causes?” If you’re a giver and not greedy, it’s a no-brainer. Look at TOMS’ business model. Giving away a pair of shoes to a poor child for every pair of shoes sold is following that model exactly! More startups are doing this. I like what I see! Joanna: To conclude, gleaning from all of your experience, what would you say is the most important lesson you’ve learned from your past and current startup? Emanuel: I can’t emphasize enough the importance of frequent clear communication and developing and retaining good relationships with every team member. Good rapport, trust, respect and transparency for all, including the visionary/leader are a must. I am grateful I have this with my current team, especially my cofounder. If this isn’t possible, then maybe the personality of those team members aren’t a fit for your startup. Also have fun with your team! Get together regularly to do something social. It’s OK to be friends with your team. You’ll have much more trust and loyalty that way! Lack of communication is a common mistake to make because it’s easy to assume that the team is automatically on the same page with the current short-term and long-term goals. Although that may have been the case every other time, it doesn’t mean it will be the case every time. George Bernard Shaw once said: “Communication is the illusion that it has taken place”. Inevitable with a startup, there will be unpreventable and unforeseen obstacles that some team members might view as a failure. This is why the visionary/leader must get constant buy-in about short-term and long-term goals from every team member throughout the process. Frequently confirming everyone is on the same page is a way of getting back on track when obstacles appear. For instance, investors may become apprehensive if suddenly more money is needed for an unforeseen setback. A simple review of the recently discussed long-term goals will help them get onboard faster for the new short-term goals. If long-term goals haven’t been reviewed for months, individuals might have more difficulty remembering and getting on the same page. Had I been more firm with my communication with my previous startup, there would have been a much better outcome. Joanna: Is there anything else you would like to add? Emanuel: Team members need a thick skin when there’s outside criticism. There will be criticism, but remember that outsiders don’t know the mission and vision like the team does. Always stay united and back your team over outsiders. If you can see how outside criticism has affected your team, hold a debriefing meeting to address this. It will prevent resentment, bickering and teammates being at odds. Don’t get stuck being overly cautious or a perfectionist. Attempting to perfect a product or service can cause the team to lose focus on getting to market. Startups must be agile. They must accomplish a huge amount quickly with minimal budgets. Follow your dreams, goals and gut. They will inspire you to succeed. Inspiration and dedication are everything! Never commit to a venture solely for the money or greed. It’s become more difficult to get away with greed due to technology and transparency of the information age. You’re only a few searches away from the truth! Greed will only demonize you. Give it up permanently. Always give more than you receive: That’s how real value is created. We don’t live in a zero sum world. Economies grow with inspired, innovative activity. Everyone loves to help givers. Have and use mentors who you believe in and trust. Work with people that inspire you and you inspire them. This kind of teamwork is priceless! Understand why you are doing your venture. Then go tell the world what’s great about it. If you don’t give up on your dreams and goals, you will succeed! Always act with integrity, loyalty and transparency. .
PR and marketing are important to get your message out. Don’t believe in magic, believe in yourself and the magic will happen. Fans of crowdfunding operations in the United States like Kickstarter will be excited to know that a financial revolution just happened this week. Prior to Wednesday, one had to have $1 million in net worth or income of at least $200,000 for each of the last two years in order to become an “accredited investor” and hence be able to easily invest in startups. As part of the implementation of Title IV of the JOBS Act, the Securities and Exchange Commission has now relaxed the rules, allowing startups to raise up to $50 million by selling stock online to small investors. The democratization of investing is underway. 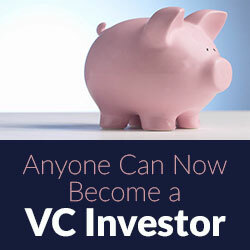 Anyone can now become a VC investor, and unlike with the Kickstarter model they will have an actual stake in the company. This opens the way for small investors to be connected to small companies that would otherwise find it difficult to get funding through more traditional means. In the interests of preventing a sudden repeat of the dot-com bubble, and protecting investors from potential scams, there are still some restrictions. Individuals can only invest up to 10 percent of their net worth, and the $50 million limit on startups includes equity, debt or convertible debt-to-equity arrangements. Offerings will still need to be vetted by the SEC in a process that still requires some legal assistance, but it is more straightforward and accessible than a full IPO. Online platforms offering the investment service still need register with the SEC as “broker-dealers.” and will be subject to the same regulations as other institutions authorized to act as financial middlemen.The way in which startups can solicit for investments will also be regulated, particularly on social media. There is also no requirement for startups to create a system that enables potential investors to share information among themselves. Crowdfunding is taking off around the world, and the World Bank estimates that by 2025 the global equity crowdfunding market will reach the $93 billion mark. Some commentators have warned that there is a technology bubble currently inflating, however others point out that unlike the dot-com bubble of the late 1990s and early 2000s, more of the technology companies in Silicon Valley are actually producing revenue this time around, and the maturity of the internet means that companies are succeeding in markets today where early entrants failed last time. With that being said, some valuations have been described as “excessive,” such as Snapchat’s rejection of Facebook’s offer to buy the company for $3 billion in 2013. Will the SEC’s regulations be enough to prevent inexperienced investors from flooding the market with more money than sense? Will they lead to a vibrant rejuvenation of a new generation of dynamic startups? Time will tell. Over the years of consulting startups I have ran into times where I needed to call Mark Leonard of Davis & Leonard LLP. Mark is a top notch attorney focusing on trademark and copyright registration, general intellectual property (IP) counseling, e-commerce, licensing, and litigation in the areas of trademark and copyright infringement, computer intrusion, Trademark Trial and Appeal Board proceedings, and ICANN Internet domain name disputes. Often when calling Mark it is in situations that could have been avoided by the startup founders and management if they had considered IP issues in their initial business planning. Such hiccups can be very serious and are a clear black mark in the history of the startup which becomes a liability when looking for angel or venture capital funding. Not only does it become a problem when looking for funding it also pulls founders’ and staffs’ time and resources from growing the company to fighting a lawsuit. To help startups educate themselves before they get into hot water Mark has taken his time to let us interview him on common IP issues facing startups. Joanna: When choosing a name for a new company what are some common mistakes startups make? Mark: One of the top mistakes I see startups make is failing to conduct a comprehensive trademark search prior to launching the company. This is likely because there are a number of myths that cause businesses to believe a search is unnecessary. For business names, a very prevalent myth is that there is no need to search if the Secretary of State’s office approves the name of a corporation or limited liability company. The Secretary of State’s name approval process uses criteria different from trademark law and only checks against corporate and limited liability names registered with that state. It does not does not consider federally registered marks, partnerships, sole proprietorships, business entities in other states, or even state trademark registrations. It is not uncommon for trademark conflicts to arise between businesses in the same state that have both had their names approved by the Secretary of State. A second myth is that it is sufficient if no identical matches are found after searching a mark on the Internet or United States Patent and Trademark Office (“USPTO”) records. Trademarks need not be identical for a conflict to arise, phonetic similarity or similar meanings are sufficient. These searches are also incomplete because trademark rights are acquired through use not registration and many businesses do not advertise on the Internet. Thus, these searches may miss potential conflicts. Startups should also be wary of mass market legal service companies that offer trademark registration services. These companies often generate voluminous search reports, but because they cannot give legal advice there is no explanation as to whether the reports show any potential conflicts or not. Startups should work with an experienced trademark attorney to conduct a comprehensive trademark search early in their business planning process to ensure the chosen name for their business, product, or service does not conflict with another trademark. Joanna: A couple of years back a hot Silicon Valley startup named one of their key products the same name as a European nonprofit. The startup’s product had nothing to do with the mission or focus of the nonprofit and wasn’t even sold in the same industry or same country. However the European nonprofit was fairly wealthy and sent several cease-and-desist letters and threatened to file a lawsuit if the product name wasn’t changed. Facing the threat of a lawsuit, the startup ended up having to come up with a new product name after it was heavily branded, and incur the costs of rebranding and throwing away all its marketing material. What are the best practices when choosing product or company names? Mark: Coming up with a protectable trademark is very important. Whether a word or name is protectable as a trademark is determined by its strength. The strongest marks are fanciful, such as made up words like “Xerox”, or arbitrary, English words that have nothing to do with the product or service they are used with, such as “Apple” for computers. The next category of strength below arbitrary or fanciful is suggestive. A suggestive mark suggests, but does not directly describe, the qualities associated with the word in connection with the product or service with which it is used. An example is “Apple-A-Day” used in connection with vitamins. “Apple-A-Day” is associated with being healthy which is a characteristic that comes to mind when thinking about vitamins. The next type of marks are descriptive. Descriptive marks immediately convey a characteristic of a product or service, such as “5 Minute Workouts” as a mark for series of workout videos that can be completed in five minutes. Descriptive marks are very weak and may be difficult to register or enforce. The weakest category is generic marks. A mark is “generic” if it is commonly used for the general name for a product rather than for identifying a particular source of a product. “Thermos”, “escalator”, and “aspirin” are examples of marks that have become generic because the public commonly thinks of and uses these terms to name the products themselves rather than to identify a specific source or origin for them. Startups should strive to choose arbitrary, fanciful, or suggestive marks. The distinction between suggestive and descriptive marks is very fact sensitive and may not be readily apparent. An experienced trademark attorney can help a startup ensure their marks are protectable and should be involved early in the trademark selection process. Joanna: Startups often have limited resources and try to cut corners in hopes of saving a dollar here or there. I often have to remind startups to never use clipart from other websites. Often those reminders aren’t taken seriously until I give them examples of an actual founder of other startup that have called me in desperation after they have received letters from stock photo companies demanding payment of a $21,000 fine for using a photo without the proper license. The founder ignored the letter but then realized this wasn’t a joke as more letters showed up and lawyers started to call. At the end the founder settled the case out of court with a lawyer’s help paying $1800 however the issue could have been avoided entirely by buying the correct license from the start for only $2. 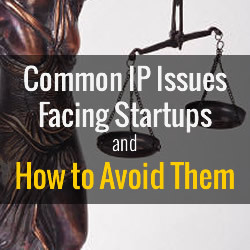 What other IP issues do you see that often cause problems for startups? Mark: Startups should have employees and independent contractors sign contracts to make sure that ideas and works created for the business are owned by the business. It is a common misconception that hiring someone to create a work for a business automatically gives the business ownership of the work. To make sure it owns the rights in all of the intellectual property in works it pays for, a business should enter “work made for hire” and assignment contracts that explicitly confer rights in the works to the business. This happens very frequently with startups that use an outside web developer to create the company’s web site. Often the developer agreement is silent on who owns the code for the site or states that the developer owns it. This means that if there is ever a dispute with the developer the startup can’t simply hire a new developer to make changes to the site. Website development agreements should specify that the startup owns the code or at least has an irrevocable license to use the code. I’ve seen many companies have to rebuild their sites from scratch because of this issue. Startups should also ensure that they keep track of passwords for web domain and social media management. Often only one employee or founder is responsible for website maintenance and distributing content on social media. If a dispute develops with that person the startup could be locked out of their accounts if that person is the only one with the account information. Over the years I have had to review and give feedback on Powerpoint presentations prepared for startups to use when they are pitching to Angel Investors and VC Firms. There are some common rookie mistakes that I see which are a sure-fire way not to get a second meeting that can lead a startup to get funded. Great ideas are everywhere, however a great idea that is well thought out and a well prepared presentation can lead to funding. By taking the following tips, you can mold your presentation to be an asset rather than hinder your funding process. 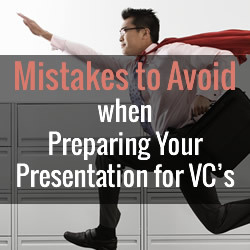 Avoid lengthy presentations that leave investors bored. You want it to be short enough to have time for questions and answers. 15 slides or less for a one hour meeting is ideal. A presentation needs to show your idea, the nature and size of their market for the problem that your idea will solve, how the idea will be executed, competitors, who will be involved, how qualified are they to be involved, how much will it cost, and how much profit potential your idea has. VCs will be much more willing to help finance a company if there are clear goals with defined milestones, and a breakdown of where the growth potential is. Avoid unrealistic figures. VCs have seen it all. The last thing they are going to invest in is a company that doesn’t show realistic conservative figures and doesn’t line up with targeted industry growth potential. If anyone pitches a company to me and says “We have no competitors” I immediately become skeptical. Like many investors I see that they are not business savvy and not worth investing in. Every company has a competitor. Make a table in your slide that lists the major and potential competitors and how they compare to your company. Do not overstate your background information. VCs do their due diligence if they are going to invest, and they have the skills of a professional poker player having developed a highly tuned sense of when someone is bluffing. You would not want a lie that seemed good at the time to be the deciding factor in why you did not get funded. When preparing your presentation and power point slides, be ready to be interrupted. VCs likely will have questions that interrupt your presentation. Do not rush to answer them quickly or avoid them altogether to continue back to your rehearsed pitch. This is where VCs really see if you are knowledgeable, have thought out every aspect about your company, have realistic growth potential, and truly understand your target market. This is when a VC starts to grasp the risk and reward of investing in your company. Keep your presentation material neat and clean, not cluttered, easily viewable from a distance, and free of spelling or grammar mistakes. Your first impression needs to be tight. By taking these tips, you can mold your VC presentation to be an asset rather than hinder your funding process.